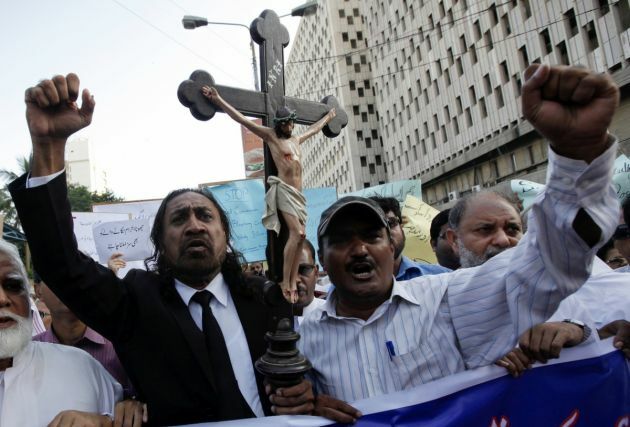 (Photo: REUTERS / Akhtar Soomro)Members of the Pakistani Christian community chant slogans during a demonstration to condemn the death of a Christian couple in a village in Punjab province on Tuesday, in Karachi November 6, 2014. A policeman in Pakistan hacked a man to death for allegedly making derogatory remarks about the companions of the Prophet Muhammad, police said, just two days after a Christian couple was lynched over blasphemy in the same province. A Catholic priest who heads a Pakistan inter-religious center has called on the United Nations to intervene after the torturing and burning alive of a Christian couple accused of blasphemy for allegedly burning pages of the Quran. "The burning alive of a Christian couple is a test case for our government. Our government must provide protection to all citizens and especially to the poor and downtrodden Christians," Father James Channan, a Dominican, director of the Peace Center in Lahore. Channan told the Fides Catholic news agency on November 4, Vatican Radio reported, "We are shocked and worried. Christians in Pakistan are now wondering: what country do we live in?" Shahzad Masih and his pregnant wife Shama Bibi were accused of committing blasphemy against Islam by allegedly burning pages of the Quran. They were taken hostage for three days before being thrown into the flames of the Brick Kiln factory in Kasur, Pakistan. Brick Kiln factory owner Yousaf Gujjar and his manager instigated Muslims of nearby villages to punish the couple after a Muslim employee complained about them. "On November 1st, the couple was locked up at the owner's office. They were tortured for three days and then accused of desecrating the Quran," Haneef Masih, a local Christian, told International Christian Concern. "The clerics made announcements through the mosque's amplifiers and instigated the Muslims to kill the blasphemers," he continued. According to the BBC, a mob of more than 100 people violently took the couple from the room where they had been held, tied them to a vehicle and dragged them to the brick kiln. Pakistan Christian Post reported that when the Christian couple was burning and crying innocence, the Muslim mob was shouting "Allah hu Akbar," "death to blasphemer," "kill infidel Christians." There were about 10 - 12 other Christian families working in the factory who have since left the area for their personal security. A senior human rights activist in Lahore condemned what happened saying that the case is a misuse of blasphemy laws. He urged authorities to ensure that religious minorities be protected and that the guilty be arrested. Nazir S. Bhatti, president of Pakistan Christian Congress, said Pakistan's blasphemy laws are only legislated to target religious minorities in Muslim-majority Pakistan. He urged Christians to raise their voice against blasphemy laws so poor Christians may not be targeted on "pretext to blasphemy." ICC Regional Manager Todd Daniels said the incident highlights the religious fanaticism that Christians face in Pakistan. The accusation of blasphemy, according to him, can be used anytime and can be deadly as what happened with the couple. "It remains urgent that the Pakistani government address the issue of false accusations of blasphemy. The actions taken by the federal courts in sentencing Christians like Asia Bibi to death provide motivation for mobs to carry out their own extrajudicial punishments."